HR professionals are being challenged to develop strategic metrics that help senior executive teams make important decisions. Based on research in 2000+ organizations featured in the book, Hidden Drivers of Success: Leveraging Employee Insights for Strategic Advantage (SHRM 2013), this session will discuss the key reasons why traditional surveys are failing, what smart companies are doing differently to move beyond one-dimensional "engagement" type surveys, how strategic HR leaders are gaining executive support, and how to measure the impact of your survey efforts. The new strategic surveys are adding value in a wide number of areas: helping with recruiting, onboarding, performance management, training evaluation, leader development, retention of top performers, employer branding and many more talent decisions. Dr. William "Bill" Schiemann is founder and CEO of Metrus Group, specializing in performance measurement and organizational change. He has consulted extensively with corporations on the development and implementation of business and people strategies; HR measurement; strategic employee surveys and internal value assessments; and creating high performance cultures. He also founded the Metrus Institute, which supports research and publications, many in the human capital arena. Bill is a thought leader in the human resources field, having written scores of articles and six books in the human capital area, most recently the SHRM-published book, Hidden Drivers of Success: Leveraging Employee Insights for Strategic Advantage (2013). He is the Past Chair of the SHRM Foundation Board of Directors and currently serves on the Board of Directors of the HR Certification Institute. He has been named a Fellow and Scholar by the Society of Industrial and Organizational Psychology. 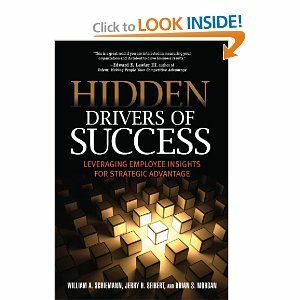 All Attendees will receive a copy of Dr. Schiemann book "Hidden Drivers of Success: Leveraging Employee Insights for Strategic Advantage"